Not all compact radios are the same. The TY91 is easier to use and faster to tune, consistent with our ‘better by design’ philosophy. The TY91 has a unique ‘push step’ feature providing the fastest in class frequency selection. With additional features like Dual Watch and a built-in intercom the TY91 is ideal for most GA users requiring a certified aviation radio. • 8.33 and 25 kHz channel spacing – compliant where 8.33 is required. • Unbeatable value and quality – designed and manufactured in the U.K. The Trig TY91 takes up minimal space and weight. With a crisp clear display (with manual dimming) and simple user interface the Trig radio benefits from some great features; ‘Dual Watch’ allows the monitoring of two frequencies at the same. There are 9 pre-set channel memories which are all easily selectable. The radio can integrate with popular GPS units; this allows the automatic display of en-route radio frequencies (uses industry standard SL40 protocol). The radio also has a built-in two place intercom with an aux-input, saving further cost and weight. The innovative use of a control head and separate radio hardware unit provides more installation options, especially when space is at a premium. The control head can be conveniently mounted in a full 57mm (2 ¼”) round hole or even smaller compact mount. Fitting is straightforward, and once installed the depth of the radio control head is only 74mm (3”). In practice this means that the Trig TY91 and TY92 control head can be located in an aircraft instrument panel where a ‘single box’ radio will simply not fit. The TY91 is the perfect comms partner to our TT21 and TT22 Mode S (1090 ES ADS-B Out transponders). 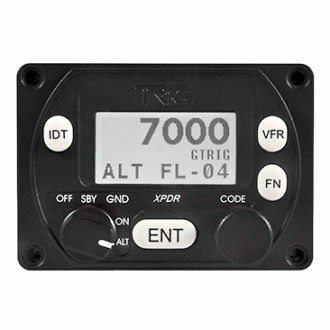 The TY91 is EASA ETSO and FAA TSO approved so it can be used worldwide. For customers who do not require 8.33 channel spacing this feature can be disabled, allowing speedy selection between 50 kHz and 25 kHz spacing. 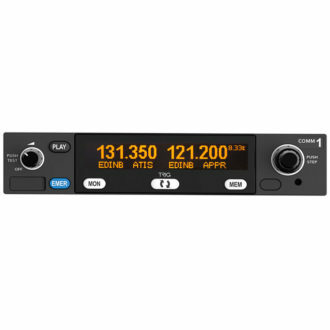 This enables rapid change of frequency whilst providing fine tuning in 25 kHz steps. The TY91/TY92 are both 8.33 kHz and 25 kHz radios, this means they already comply with future planned airspace changes in Europe, when 8.33 kHz becomes mandatory. 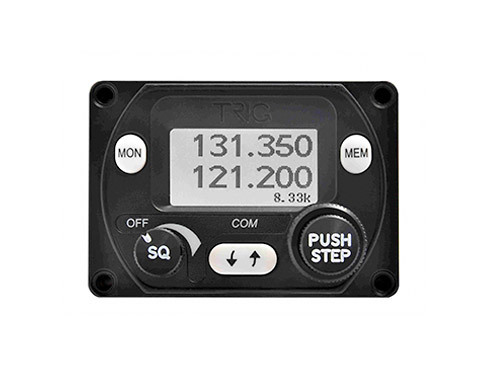 The TY91 Trig radio two place intercom is optimised for use with standard aviation headsets – a number of adjustments allow the radio to be used in noisy aircraft. The TY91 also has a built in speaker amplifier that can drive an external speaker, this is preferred by some glider pilots. If using a dynamic microphone with a Trig radio please note an amplified adaptor will be required.